With the last Harry Potter movie in the piping (due for a global release this weekend), it is understandable if the Potter craze gets a little irked this time around. And in true keeping with my Pottermania, in this post, I am going to examine the effect the release of Potter books/movies has on us. Given the lack of horizontal velocity, height, wheels, or sharp edges associated with this particular craze we were interested to investigate the impact the Harry Potter books had on children’s traumatic injuries during the peak of their use. 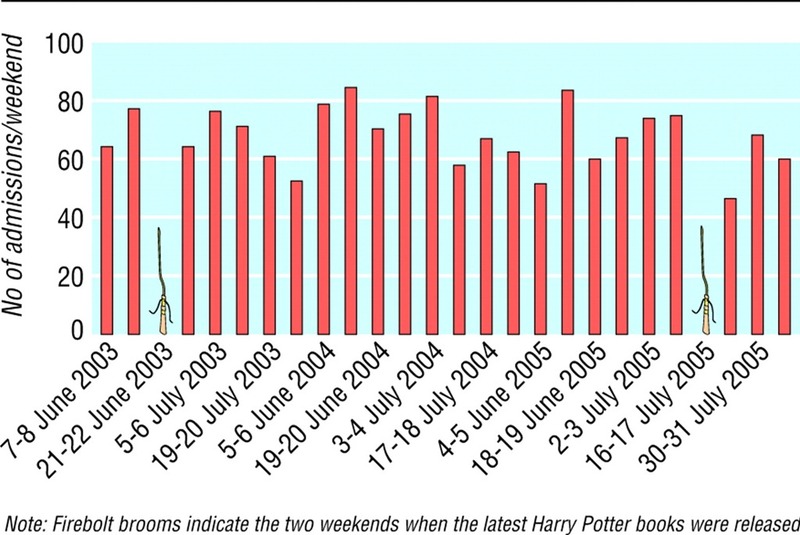 In a scrupulously designed study, they screened out weather issues on the weekends of the release of The Order of the Phoenix (Saturday, 21st June, 2003) and The Half Blood Prince (Saturday, 16th July, 2005) and compared numbers of admissions of all children aged 7-15 years attending to the Emergency Department with musculoskeletal injuries on those weekends with the ones in other adjacent weekends in the similar period over the past few years. We observed a significant fall in the numbers of attendees to the emergency department on the weekends that of the two most recent Harry Potter books were released. Both these weekends were in mid-summer with good weather. It may therefore be hypothesised that there is a place for a committee of safety conscious, talented writers who could produce high quality books for the purpose of injury prevention. While the role of distraction therapy has been very well studied and implemented in the setting of carrying out painful clinical procedures, it is a novel idea in the field of injury prevention. Childhood trauma can lead to significant morbidities in later life and hence this sort of a distraction based intervention is indeed of great value in this regard. However, the authors sign off with a warning note when they say that this might complicate issues by causing an unpredictable increase in childhood obesity, rickets and cardiovascular morbidities. Now that makes it a bit of a double edged sword, don’t it? Note: In case you are aware of more Harry Potter oriented, convention breaking research like this one, send them my way. You can email me here: pranab AT pranab DOT in. Tags: BMJ, Harry Potter, MedBlogging, PostADay2011, Research Blogging, Trauma. Bookmark the permalink. Previous post ← We’re Speaking of Medicine on @PLoS! nearly as much as the kids glued in front of the tube.